Current Status: 23,951,897 Total Data Points from 2,313 Worldwide Locations. 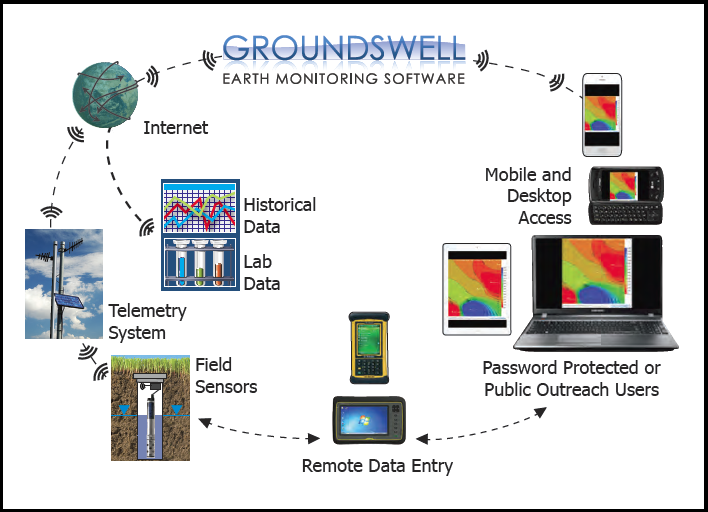 Groundswell's software platforms use raw data to automatically generate intuitive visualizations that all stakeholders can readily understand. Raw data derived from sensors, databases or on-site field observations are rapidly interpolated and instantaneously posted as map layers via the Internet. The platforms are sensor and media neutral, and as such, can be used for a multitude of applications. Triggers can also be automatically engaged to alert key personnel or to automatically adjust field activities. Our software operates with any modern web browser on any device, such as smart phones and tablets, empowering the mobile workforce.